The Ehang 184 personal airborne vehicle undergoes testing in Dubai. Not all automated vehicles will drive on roads, says Barry Kirk, executive director of the Canadian Automated Vehicles Centre of Excellence. They’ll also be in the sky, and sooner than many people think. “What was once science fiction is now becoming fact,” Kirk said in a presentation to the Automated Vehicles 2017 conference, which he called “The Jetsons, Part 2.” The event was hosted by the Conference Board of Canada. Kirk gave examples of flying cars that are close to production, such as the Ehang 184, which is testing in Dubai. 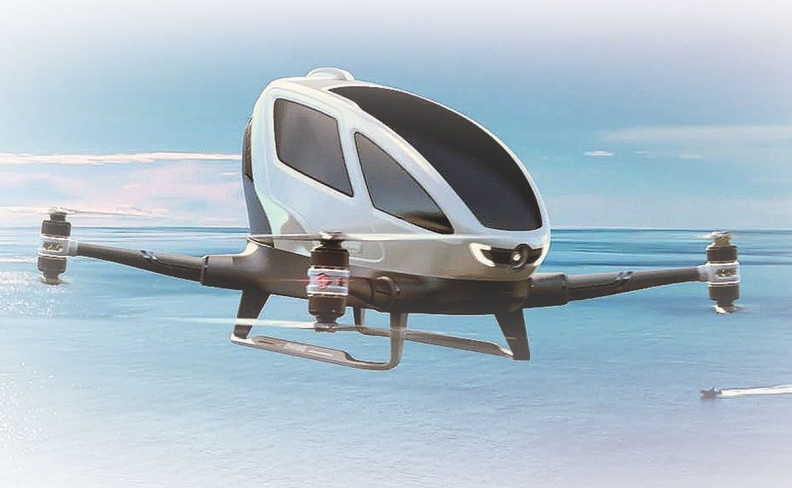 It’s an electric, single-seat, autonomous drone that Dubai’s Road and Transportation Agency wants to launch as a taxi service this summer. “This is a personal airborne vehicle, or PAV,” said Kirk. “And this isn’t science fiction. The Prime Minister of the United Arab Emirates has said he wants to have 25 per cent of all passenger trips in driverless vehicles by 2030, and he includes in that both ground and aerial AVs. Airbus also has two separate ongoing projects for small flying AVs, with a target for a working prototype at the end of this year, while ride-hailing company Uber says it wants to offer a flying-taxi service within 10 years. On some trips over congested cities, such as San Francisco to San Jose, Calif., Uber even believes the flying service could be cheaper than driving on the road, while being considerably faster. “If you can do it in 15 minutes instead of two hours, and save money, that’s a very compelling business case,” says Kirk. Flying AVs have the advantage of needing less sophisticated technology for reading the road ahead, with no pedestrians or traffic lights or potholes up in the sky. If a flying network becomes commonplace, however, it’s essential that flight plans must be filed and processed and monitored within seconds by a central computer system. “It’s clear to me that we’ve got in Canada a strong aerospace industry, and a very strong drone industry. About 400 companies in Canada are involved in drones,” said Kirk, who sits on the board of directors of Unmanned Systems Canada, an association for the drone industry. The biggest challenge will be whatever federal policy is created to regulate drones, which might not permit their use over populated areas, or be overly restrictive. However, with a policy that allows and regulates airborne AVs to work as taxis, Kirk anticipates they could begin use in Canada in the 2020s, with “significant deployment” in the 2030s.